Any reservation booked for 9 persons or more will be considered as a group reservation. In this case the hotel reserves the right to ask a prepayment as a guarantee for the reservation. The prepayment amount is 10% of the total reservation value, acceptable by bank transfer only. The credit card number given as guarantee for the reservation will be held as security deposit for the whole group in case any damage will be caused to the hotel. We might not be suitable for elderly groups (no elevator, 5 floors). 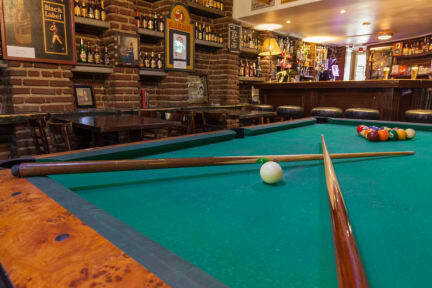 Just 5 minutes walking distance from the central train station, has a 24 hour bar with a pool table and a big screen TV, Travel Hotel is the best place for you to enjoy in the very centre of Amsterdam. The Dam Square, Royal Palace, the famous canals and the major shopping street are just around the corner. 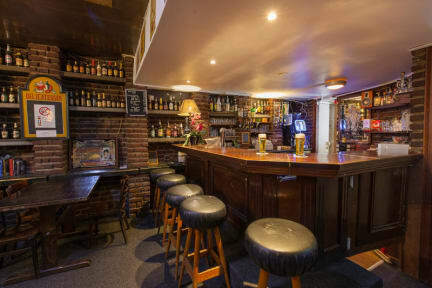 The Flower Market, the Anne Frank House, all kinds of bars, restaurants and clubs are within walking distance. Because of the structure of the monumental building we are housed in, none of our rooms are the same, but all are simple and clean and equipped with washing facilities and television. We have single, double, twin, triple and quad rooms. Apart from basic rooms with shared facilities we also have rooms with private facilities. Cancellations which are not made at least 48 hours in advance are subject to a one night charge. Please note: our bed rates are excluding 5% city tax and breakfast. Check in starts at 14.00hrs but early check in may be possible if the room is available. Check in is until 0.00hrs (midnight). All arrivals after midnight must be reported in advance. Arrivals after midnight, which were not reported cannot be guaranteed. Latest Checkout Time = 10 am. Reservations are guaranteed with valid credit card details. The card will not be charged prior to arrival. We will get an authorization, maximum 7 days prior to arrival for the costs of the first night, minus 10%. When authorization cannot be obtained, we will contact you. If you do not react within 24 hours, your reservation cannot be guaranteed. Location very good, major sightseeing is within walking distance but church outside constantly rings bells, expect to be woken up or kept awake by them. We were on the fifth floor so if staying travel light as there is no lift. Only 2 plug sockets in the room for 4 people so take extension as this was not enough at all. Other than that, the room and bathrooms were spotless and exceeded expectations for someone who had never stayed in a hostel. Staff were nice too! The room and bathroom were very small. Overall cleanliness could much improve. No elevator. Will have to carry bags up narrow stairs yourself. Staff were nice. Location was great. The hostel itself is in a really good location close to the station and moderate walking distance from most tourist attractions. We were placed on the fifth (top) floor which was a struggle with our massive backpacks as the stairs are very steep and narrow, not sure if you can request a room on a lower floor? The room was very small and absolutely baking hot in the day but a small fan was provided so it was ok at night. TV in room with English channels, bar quite expensive. I was subject to racial profiling by one of the members of staff. Two of my friends walked in with no issues but I was told to leave by the member of staff as he didn’t not believe I was a paying customer. He then asked me to verify my name and booking even though he did not ask of the other guests. Narrow staircase, no elevator, high building, room on the 5th floor. Very noisy, right next to the city center with lots of party places - that might be good for others. :) Small rooms: 3 bunkbeds but only one chair, no place to sit down, pack things or eat. No community room. No storage for suitcases on the departure day. Staff didnt wanna help in any problems. Still: for this money, i guess this is what u get in Amsterdam! I wasn't expecting much because it was cheap and it is a hostel, but I was really quite disappointed with the whole experience and glad I only booked 2 nights. I arrived to the most cluttered and messy check-in desk I had ever seen. The bedsheets were dirty; the towels ripped and tattered; the lockers only work if you have an enormous padlock with you and as I was on the ground floor by the bar, I didn't sleep at all because of the noise coming from lads playing pool till 6am. Avoid. I wish that the staff could respect me as a customer even if i am a middle-aged woman. i have been living in hostel all my Life, but never ever I have heard from somebody that i am too old to stay in a hostel. The third night I stayed in Another hostel and there I felt much free, respected and good. Horrible experience. Rudest hostel staff I’ve ever encountered. The room was dirty when we got there! The sheets weren’t even changed, as there was hair all in my bed. The bathroom was gross. Check out was at 10am, which we were aware of, but at 9:50, as we were all packed up and just putting on our coats and such, the staff came and knocked on our door telling us it was time to leave!! It wasn’t even 10 yet! Worst experience ever. Pay the bit extra to stay somethwhere else.